What’s The Best Tactical Tomahawk? The tomahawk is an impressive weapon and tool. When people think of the tomahawk, they think only of something that can be thrown, or used to kill, but a tactical tomahawk (also known as a tactical axe, military tomahawk, or army tomahawk) can do so much more than that. For those in a survival situation, it can be the difference between life and death. Yes, it can be used as a weapon, but it can be used to chop wood, to dig a pit and more. Even today, soldiers in Afghanistan use the tactical axes as both a weapon and a tool. Let’s delve in deeper to what a tactical tomahawk truly is. The tomahawk, of course, has its start with the First Nations people of the United States and Canada. The tomahawk was first created by the Algonquian Indians. These early tomahawks were just stones attached to wooden handles, secured with strips of rawhide. The tomahawk was essentially a tactical tomahawk, used for chopping, cutting and hunting. When Europeans arrived in North America, they introduced the metal blade, which altered how the tomahawk was made. It has helped to improve the lifestyle of the native people, especially with hunting because the blade would not break as easily. With the new metal, tomahawks had a hammer or spike on the other side of the blade, so that the tomahawk could be used in an increased number of situations. In addition, the pipe was sometimes attached, allowing for smoking with the tomahawk. Today, the military tomahawk has changed greatly and was used by the US forces in the Vietnam War. These were known as Vietnam tomahawks (military tomahawks) and were used in combat. The American Tomahawk Company now makes tactical tomahawks for the U.S. Army, which have been used in both Iraq and Afghanistan for hand-to-hand combat and as tools. Even law enforcement are using tomahawks now. The features of a tactical tomahawk will not vary too much. The tactical axe will be made of a light-weight material, but be very strong and durable. The handle will feature finger grooves, making it easy to hold and use. The tomahawk will not be too long, but will be long enough that it can be used as an axe or hatchet, a weapon, and a tool that can be used in survival situations. If you are going to buy a tactical tomahawk, then you need to keep in mind that there are three different types of tomahawks. Knowing which type of tomahawk you need will make the purchase of the tomahawk much easier for you. 1. Throwing tomahawk: The stereotypical tomahawk is the one you can throw. This one is used by those competing in tomahawk competitions, and it is the one that is used for hunting and self-defense. If you use it in self-defense, keep in mind that the weapon you throw can then be used against you. These tomahawks are balanced perfectly and are meant to be thrown. As a result, they tend to not be as strong as other tomahawks. 2. Combat tomahawk (or combat axe): This tomahawk is not meant for throwing, but for combat and the military. These army tomahawks are lighter because the tomahawk needs to be swung quickly and easily. 3. Tactical tomahawk (survival tomahawk): If you want a tomahawk that can be used for a variety of purposes, then you naturally need to get a tactical tomahawk. This tomahawk is meant to be used as a multi-purpose tool that can range from smashing a window or breaking a door, to opening up a crate or for hand-to-hand combat. If you want to get a tomahawk that is affordable, but will work great for you like a tactical tomahawk, then the SOG Specialty Knives and Tools Tactical Tomahawk is exactly what you need. This tool can be used for a number of different situations, including removing obstacles, extracting something, cutting wood or hunting. As a survival tool, this is an excellent option. Made with a glass-reinforced nylon handle, which can stand up to nearly anything, it is topped off with 2.75 inches of stainless steel that is used for the axe head. The stainless steel option will ensure that you don’t have to worry about the tomahawk rusting on you if you are using it in a survival situation outside. The handle is made of ballistic polymer, which can stand up to nearly anything. No matter what you are doing with the tomahawk axe, it is probably going to stand up to the worst of it, allowing you to handle easily whatever the world throws at you in a survival situation. In all, it measures in at 15.75 inches long and weighs only 24 ounces. It makes it lightweight, but still highly durable. It is so durable that SOG even gives it a lifetime warranty. Right now, we only have one survival tomahawk review complete. Be sure to visit the website soon and take advantage of the complete comparison guide. For now, watch the clip about the SOG Tomahawk. If you are looking for a high-end tomahawk, then you need to check out the Gerber Downrange Tomahawk. It’s priced at $250, and this tomahawk is made in the United States and comes with a hammer-head and pry-bar design. It allows you to use it to hammer things into the ground to create a shelter, but to also pry pieces of wood off a tree for the kindling. Made with a G-10 handle with a 420HC steel body, it also comes with a mobile sheath that makes it easier to carry with you. As the manufacturer says, the axe head will cut through walls and rope, while the hammer will smash through locks, door-knobs and hinges. The pry-bar is designed for maximum leverage, and the grip is designed so that it is easy to open whatever you need to. An excellent tomahawk of a tactical nature that comes with a higher cost but is well worth it. via What’s The Best Tactical Tomahawk? – The Tactical Guru. This entry was posted in Year Zero Survival Blog and tagged axes, camping, hiking, knives, prepping, SHTF, survival tools, weapons by staff-writer. Bookmark the permalink. Sure they can, or you can strap them to the outside. 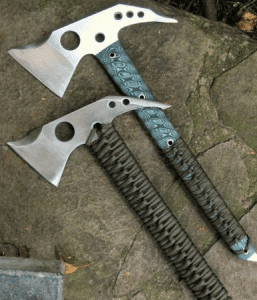 Can a tactical tomahawk be able to fit in a survival kit bag? Do they come in different sizes such that they can fit somewhere? Someone help coz I think I want to include these tomahawks as part of my survival gear.